Roland Ratzenberger deserves a permanent tribute at Imola alongside Ayrton Senna's statue, according to his former team-mate David Brabham. The Austrian died after crashing in qualifying at the 1994 San Marino Grand Prix, a day before ex-world champion Senna lost his life in the race. Brabham believes Ratzenberger should at least have a "simple plaque" at the circuit to commemorate him. "I was sad when I heard there was nothing for Roland," he told BBC Sport. There will be a special memorial service for the former Simtek driver on Wednesday - exactly 20 years since the accident - and it is understood a ceramic memorial image of Ratzenberger will be unveiled. Both he and Senna will also be remembered in four days of public events at Imola from Thursday to Sunday. Ratzenberger was 33 when he died. He had signed a deal with the small Oxfordshire-based team at the start of the season, and in doing so realised a lifelong dream to compete in Formula 1. "He didn't have it easy," added Brabham, son of three-time world champion Sir Jack. "He had no real help in terms of racing from his parents - his dad didn't approve, so Roland went off on his own." The Austrian raced in touring cars, Formula 3000 and Le Mans 24 Hours, before he got the chance to race for Simtek after impressing team owner and passenger Nick Wirth on a thrilling drive through Banbury in a Ford Fiesta. "That story about him and Nick wouldn't surprise me. Roland would have done anything to get a seat," added Brabham. "I'm glad we'd signed him. For me he was the ideal racing driver - he was fit, good-looking and had a great smile. He was fast in the car and understood the car. He was a real asset for us as a team." After failing to qualify for the 1994 opener in Brazil, Ratzenberger finished a commendable 11th at the Pacific Grand Prix in Japan - a race that had 15 retirements. "I qualified for Brazil, but he didn't, but then we both made Japan," said the 48-year-old Brabham. "We were talking about that race - he managed a finish. That was a big effort for a new team. Both of us were looking forward to the European races." Would we still be talking about Roland 20 years on if only Roland had died? Brabham had more experience in the sport. He was asked at Imola by Ratzenberger to test his car's carbon brakes, which the Austrian had complained about. Once that issue was resolved, the Australian said his team-mate felt a lot better and was confident of braking. Unfortunately for Ratzenberger, it was another car part that was the cause of his fatal accident. Earlier in the qualifying session, Ratzenberger's front wing had been damaged; it later broke and became lodged under his car. Unable to control the Simtek, he crashed into the concrete wall at the Villeneuve corner. "I can't remember how long into the session it was," Brabham said. "We had done some qualifying runs. I came round Tamburello [curve] and the red flag had come out - actually I think they were yellows at first. I slowed down. "He'd finished up at the middle of the corner - we ended up going around the outside of the car. When I saw the bits first and saw where the car ended up, I was concerned - that was the fastest part of the circuit. You're doing 300-something kilometres an hour. I looked and immediately thought he was gone - his head position, his visor was up. "You thought 'that doesn't look good' - then your brain goes into protection mode or something. The next thought I had was I had to get back to the pits to keep the tyres warm which is the most ridiculous thing to think about, but that's what I thought about." Brabham returned to the Simtek team, where his wife, pregnant with their first child, was waiting for him. "She asked 'what do you think?' I just told her that I didn't see life in the car and that he was gone, although I hoped I was wrong. A little while afterwards, that was unfortunately confirmed. "I don't remember much of the rest of the day. We put the shutter down in the garage and we walked back. There weren't a lot of people talking. Everyone was in a state of shock. Nobody could comprehend what had happened. "I don't remember much until the evening when the team sat me down and told me they had spoken to FIA [governing body of F1] and that the decision was up to me whether we continued to race." "I thought Roland had died on impact - to me that was obvious," added the Australian, who quit F1 at the end of that year. "Normally those things can take some time [to be confirmed]. I watched the Senna movie and saw the camera showing somebody coming up to tell me the news. I put my head down and walked away." Brabham said he decided to compete in the race after completing a warm-up. "I did notice when I came into the pits on Sunday that this incredibly dark cloud heaviness surrounding the team had shifted ever so slightly," he said. "I thought I have to pick this team up and continue what we're doing. I decided to race, really for the guys." He added: "I never grieved - I don't know why. I never broke down or anything like that. I don't know whether it was because I didn't allow myself because I had to keep going, keep pushing. I had to keep Simtek going." Some see Ratzenberger as the 'forgotten man' of that tragic weekend, but the Australian disagrees. "There's looking at it that way or the other way, which I prefer," said Brabham, who had been exchanging letters with Ratzenberger's parents up until recently. "Would we still be talking about Roland 20 years on if only Roland had died? 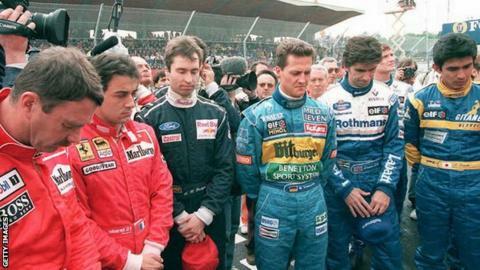 The fact he died on the same weekend as Senna means he will always be remembered." Brabham admitted that a recent visit to the circuit had awoken the memories of that race and of his team-mate - painful, but also positive. "There was no bad bone in him. He was very charming and had a fun side - everyone liked him," he said. "Roland probably died happy because he was in Formula 1 - he had a smile on his face that day and that is the last memory I have of him."